I've taken a lot of time off to adjust myself to a changing landscape. My friend points out to me that I live inside my head; she is right of course. I suppose that is an essential part of my nature and something I noticed about my youngest daughter too from an early age. I would hear her in the bath tub singing into a hairbrush microphone and telling stories to herself, living entirely in her little dreamworld. When life's vagaries intrude on this idyll we have to take time to reposition the mental furniture so to speak. Admit we are not in control of everything. Admit we are subject to to time, luck, deterioration and fate. 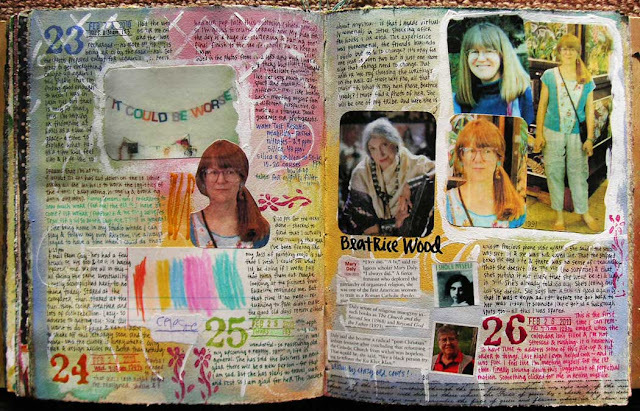 I am coming up on an important Birthday in the coming week; one I share with Beatrice Wood, a woman who I count as a friend (though I never met her) and a member of my tribe. Beatrice is mentoring me through this important passage, holding my hand and encouraging me that old age will be grand. She lived to see 105 and told her friends that she didn't believe in time. She presented herself as 32 years old and encouraged her friends to do the same. She loved to flirt. To touch people. I sure do like her. If I sound preachy on my blog it is because I am preaching to myself. You are just reading my mind. These are words I need to hear. You are welcome to diverge, to agree or not, to suss out your own path. That's the fun of it. We are each the boss of us. I am not the boss of you. 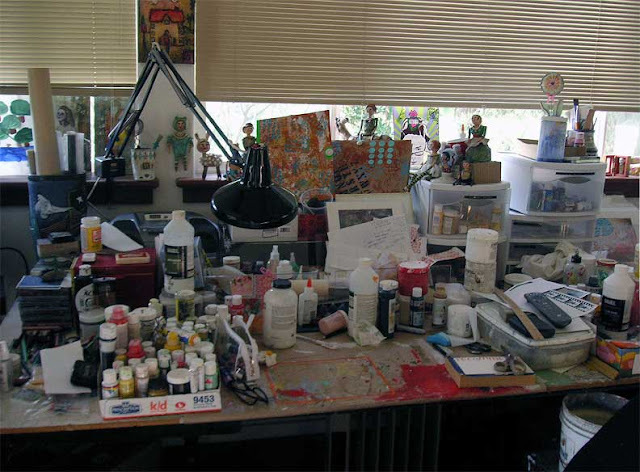 This is the deplorable state of my studio this morning. The Daphne, Forsythia, Daffodils, Plum Blossoms and Azaleas are blooming gorgeously in my yard and yet this is what I will tackle today. Clean house for company. Renewed optimism. Grateful restoration of my vision. Feeling blessed in so many ways. 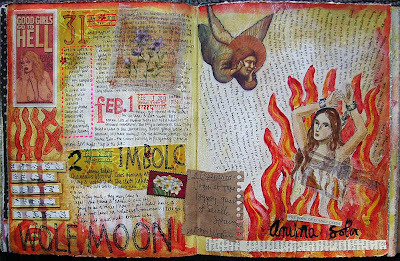 Eager, excited, thrilled to return to my studio now and bring new revelations to life in my journal and on paper. 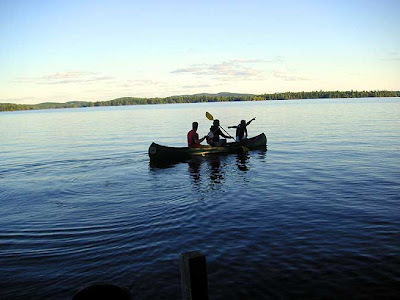 My canoe is back in the sunshine and the water is calm except for the flicker of an occasional mayfly. PS If you have time to watch a beautiful video and reflect on body image and our culture's disturbing anti-female messages, go here and scroll down to Jenette Williams's video entitled "The Bathers". I think so much of what makes a woman beautiful is her acceptance of her body, her entire fabulous manifestation. But just watch it and have your own thoughts. Women, we are beautiful. I finished this Sculpey figure yesterday, working quietly in the studio, thinking of my friends and students in Las Vegas without me, reflecting on change and time's passage and carrying on. 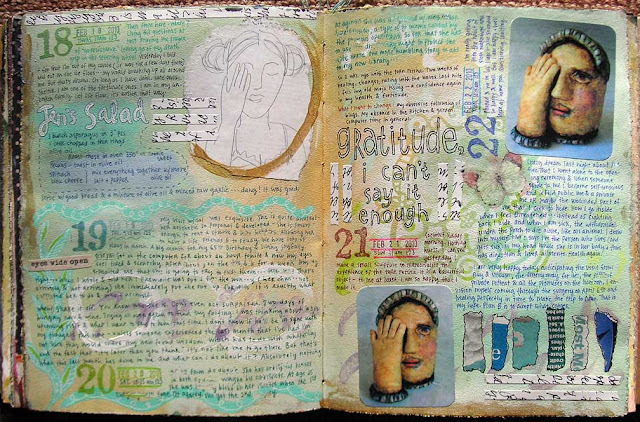 I had found a sketch that I did a couple of months ago in a pile of papers and glued it in my journal. (below). 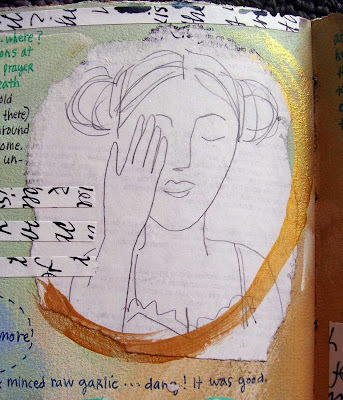 A sketch of a woman with her hand over her right eye. This is the sketch. It took on new meaning for me as things are now, needless to say. 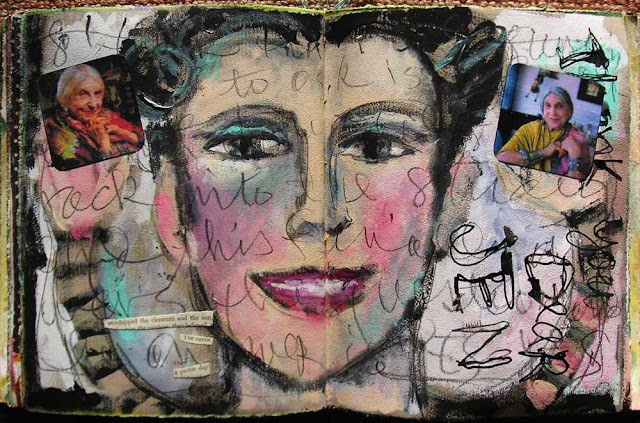 As I looked at the sketch I became inspired to interpret the drawing in clay. To make a sculpture to memorialize the experience that's just passed. Earlier in life I might have wanted to run from the memory and move on quickly but now I am much slower and more thoughtful. I no longer see life as a race to be won but rather as a performance of interaction and growth through experience. What happened to you? What did you take away from the experience? What have you learned? So many of you have shared your own eye stories with me of loss, courage, hope and endurance. Every story has given me added strength and humble acceptance. Thank you all for taking the time to reach out to me. It feels like a tribe of people at their very best, helping a fallen member. I hope I can do the same for others, for I see how much it helps to feel surrounded by love and concern. I am off restriction as of today but I won't be reading as many blogs as I used to. It's tax time and time to prepare for the upcoming paraganglioma surgery. I'm determined not to turn this into a medical blog but as artists all experiences are grist for our mills. 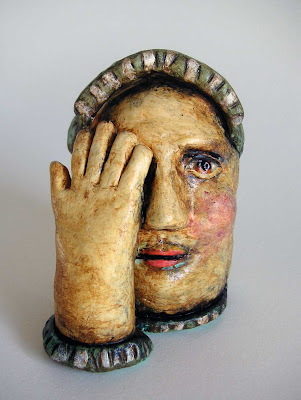 PS Just a reminder that I'll be teaching a three day Sculpey intensive at Artful Journey Retreat in July. 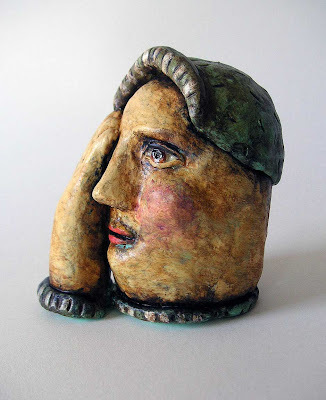 We will have lots of time to go deeply into sculptural issues as well as having the fun of playing together in clay. I'll bring my menagerie of sculptural dolls and share all my paint techniques there. Yes, I'm cheating a little here but carefully. I just couldn't wait any longer to let you know that I am getting better day by day and to thank you, thank you, thank you for your words and prayers of support. I feel that this experience has deepened my compassion for all of us humans who live and at some point suffer loss and crushing blows. I want to gather every one of you in my mother-arms and console you for any pain you experience in this life. I spent a week in the darkest sadness but turned the corner over the weekend at the beach with my family surrounding me. I spoke to my sister on the phone and her strength came to me with such force and grace that I picked myself up again. I have received love from unexpected places and I have experienced the difference that makes. I am humbled by the goodness that surrounds us all. And I am seeing again through my right eye; watching the new family of floaters and debris that is getting better day by day. I am profoundly grateful that I get to return to my new normal now. I am even more emotional than usual (big crybaby that I am) and I am so grateful; for life, vision, family, friends and especially for this amazing community of artist friends who are simply the finest humans possible. Thank you. Thank you all for your lovely messages which meant everything to me in a very dark hour. This is Shellie posting for my mom Judy. She wants you all to know that she had surgery yesterday for a torn retina, and is banned from reading, or being on the computer for 2 weeks. She woke up yesterday and had smeary blurry vision in the right eye. She then drove herself (that's just like her) to the urgent care where they told her she had a torn retina. They did cryosurgery and scheduled a follow up for Monday. She is going crazy because she loves the computer....in fact the only thing she loves more than the computer is her eyeball! We should have more information after her Monday appointment. Mom says to stop a minute and thank your eyeballs for all they do! P.S. 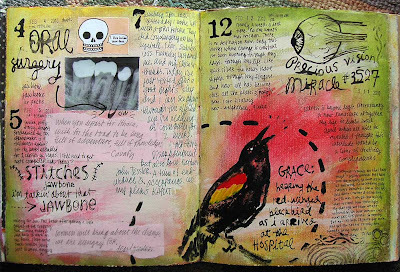 the pictures in the journal are from the oral surgery she had last Wednesday. She is not allowed to journal either. No REM allowed for 2 weeks. When it rains it pours! Finished the page I started a few days ago. Whew! Got that out of my system. Today; office supplies. Eeee, new pens, one of those long staplers and slow gazing at all the folders, papers, writing tools. If I were a pirate (which I am in my dreams and I love to talk like a pirate) my treasure chest would be full of Office Max. Arrrrr. No, this isn't a self-portrait but rather a subject I've wanted to interpret for a long time. A friend brought back a post card to me from a show he saw in South America somewhere (sorry, it was a long time ago) by an artist named Linnit DuFlor. 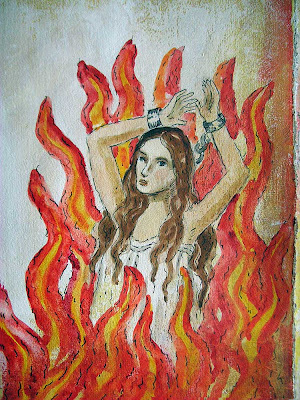 She had the martyr sawing off her handcuffs with a hacksaw while the flames dances and she painted it in watercolor which I loved. I'm pretty sure the inspiration for the painting was first done in oils. During my last trip to Santa Fe I saw another interpretation done in collage with real chili peppers representing the flames. It was at the Museum there, in a drawer. I wish I had a picture to show you. If anyone knows the story behind the original painting I would love to hear it. Is it Joan of Arc and what's with the handcuffs? 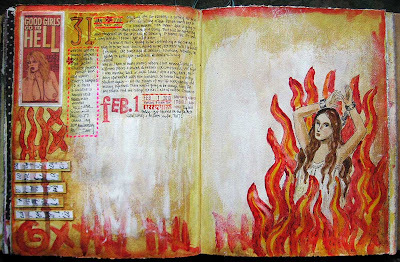 Anyway, my version was painted in my journal on a page covered with a thick layer of white acrylic which made the watercolor sit on the surface of the paint and want to bead up. I perversely love to use materials in a way they were not meant to be used. All beside the point of this post of course which is to announce that two sites have gone live offering classes where I'll be teaching this summer and fall. 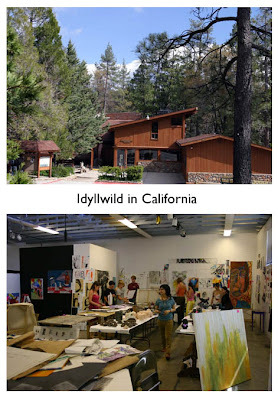 The first one is Idyllwild in California, a wonderful school that offers summer classes. 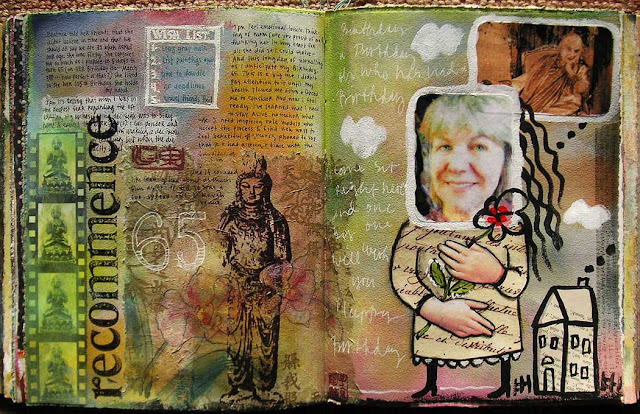 I'll be teaching a Journaling class on the 8th of July and then on the 9th and 10th I'll be teaching a 2 day class on Waxy Layers. Having 2 days for this class instead of one will allow us to really go in depth with the wax and do some wonderful work. 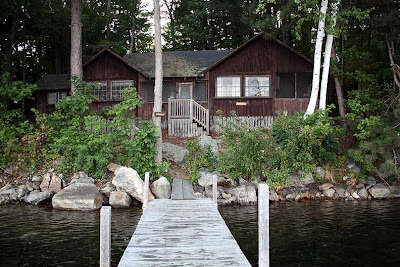 Then in September I'll be returning to Squam for my 3rd fabulous year there. 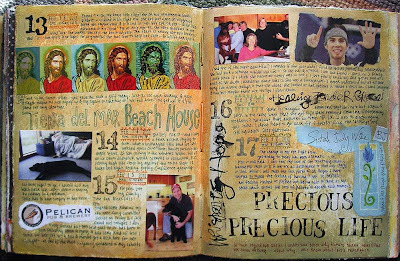 On Friday the 17th we'll spend the day making journals together like the ones I work in. This is a class that I am always asked to teach so this is it. Then on Saturday morning we'll be making Wabi Sabi paper; an approach that is half printmaking and wonderful fun turning out pages with nature themes as well as gossamer iridescent sheets that can be used in so many other book arts, painting and collage. It will be an intense morning of discovery. I hope some of you can come and dream the dream with me. Now go make something!